My fiancé has been asking me to make this cake ever since I obtained Dan Lepard’s Short and Sweet years ago. The recipe in the book is called dark aniseed cake, but I substituted the aniseed for fennel seeds as suggested in the recipe, hence the different name of dark fennel seed cake. I stuck to the recipe for pretty much everything else, and ended up with one of the most surprising, delicious cakes I’ve had in some time. 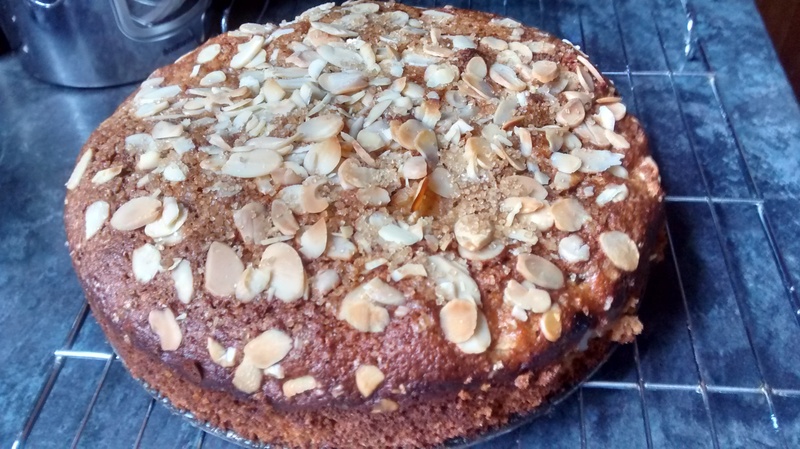 There were a few new ideas for me to grapple with in this cake – especially using spelt flour and baking with fennel seeds – and I also had to use a round tin instead of a square one as stated in the recipe, because my square tin wasn’t deep enough. So, there was plenty that could have gone wrong (especially as it calls for ale, which meant I had to drink what I didn’t use…)! Happily, the only thing that went wrong was the consistency of the icing (made with orange zest and juice), which was a bit too runny and slopped over the sides rather messily, hence the lack of a photo of the entire cake. But runny icing really doesn’t matter when you have a delicious cake that manages to combine the liquorice flavours of fennel seeds and treacle with the fruitiness of prunes and orange, topped off with the comforting heft of the spelt flour. We honestly couldn’t stop eating this cake. It’s such a good autumn cake thanks to the spicy flavours, but it’s a world away from your normal ginger or fruit cake. I would really recommend this recipe if you love autumnal flavours in your baking, but want to try something a little bit different! Call me behind the times, but I’ve only recently managed to start investigating flours that aren’t your plain, self-raising, strong or wholemeal variety. I bought a bag of rye flour the other week to bake a particular cake, but I didn’t have all of the other ingredients for it, so I settled on this rye apple and cinnamon cake from Dan Lepard’s Short and Sweet instead. 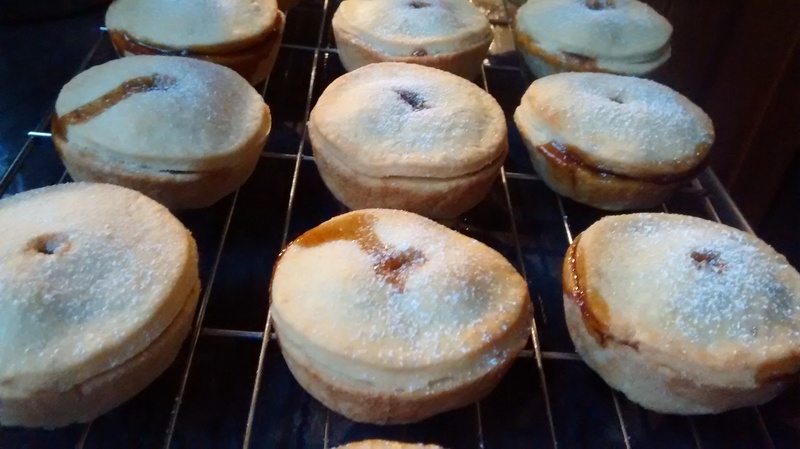 The recipe calls for this being made in a small tin, but as I only had a large one, I threw all caution to the wind and used my 20cm round tin instead (I really do know how to party…). This cake is definitely my favourite kind – really easy to make. Melt butter, golden syrup and sugar together, mix in the other ingredients and fold in chunks of apple coated in cinnamon before topping with almonds and demerara sugar, and baking. Job done! I found that I had to leave the cake in for about 15 minutes longer than the recipe said, which was partly due to my dodgy oven and partly because of the different tin I used. 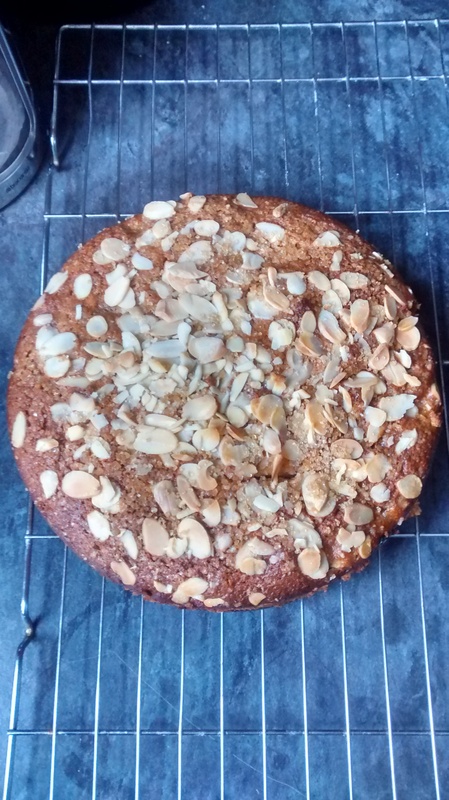 I expected to have to bake it for significantly longer than a standard cake anyway because of the rye flour (which is similar to wholemeal flour in terms of density), but that didn’t seem to make too much of a difference – perhaps because it was mixed with ground almonds. This cake is very much of the comfort food variety – you wouldn’t wheel this out for a special occasion, but it’s just the thing for teatime on a dreary autumn day. 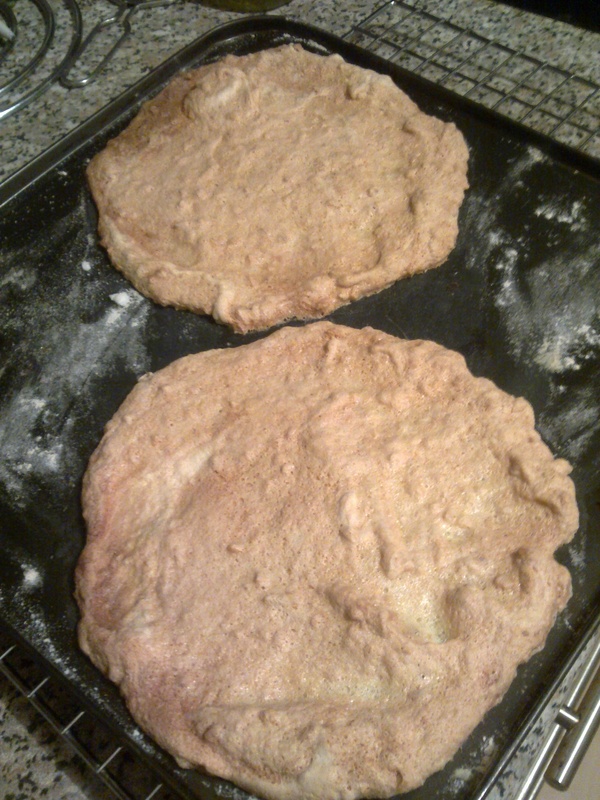 The texture is fairly rough due to the rye flour, but the flavour of the apples and cinnamon really comes through. 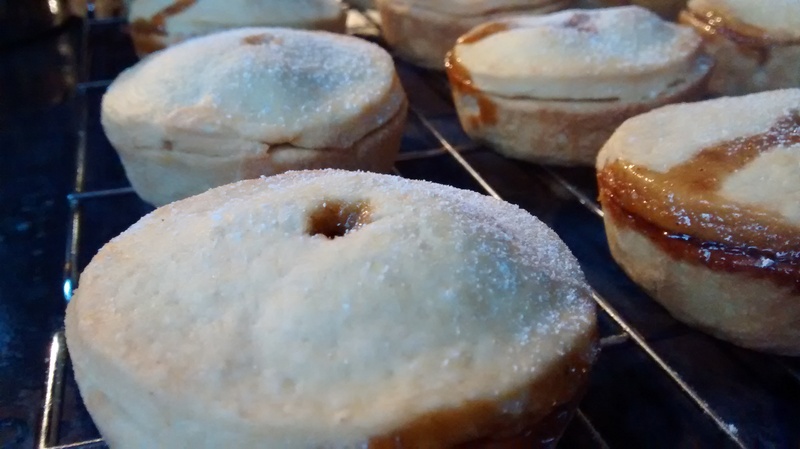 I think it helped that I used Bramley apples, but you could probably use standard dessert apples too. Definitely one to make again! My love of coconut is well-documented on this blog. Whenever I’ve baked with it in the past, though, I’ve tended to pair it with fairly obvious flavours – cherries, raspberries and mangoes, for example. So I was intrigued when I came across this recipe for orange macaroon cake in Dan Lepard’s excellent Short & Sweet recipe book. I would never have thought of pairing coconut with orange, but it’s a combination that works oh so well in this cake. 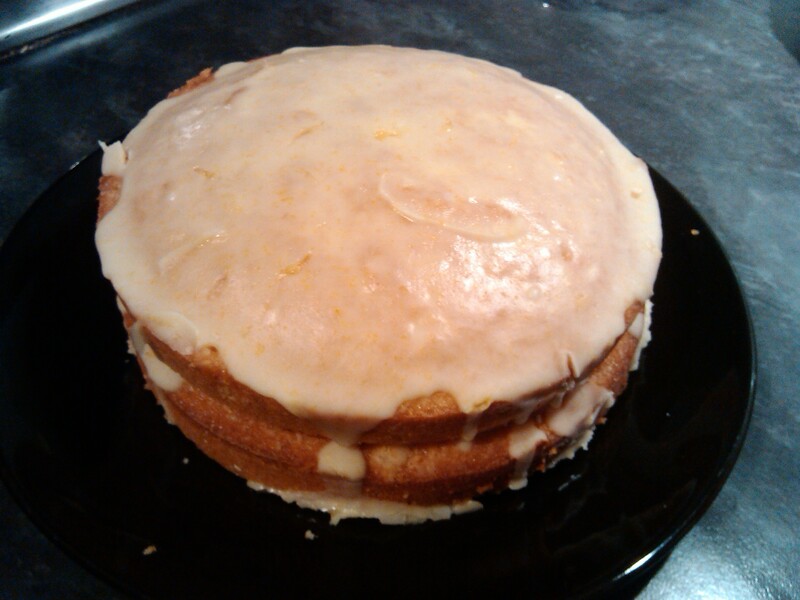 It probably helps that the orange flavour is incredibly strong – there’s the zest of two oranges in the sponge (as well as a large splash of orange liqueur) and then the zest of one orange plus some juice in the icing. Yum! The cake was very easy to make. The sponges came out beautifully – I had to leave them in a little longer than the recipe said, but that wasn’t really a problem. The icing was a doddle and the recipe makes just enough for the top and middle of the cake, which is something of a rarity in my experience as I usually end up with far too much! 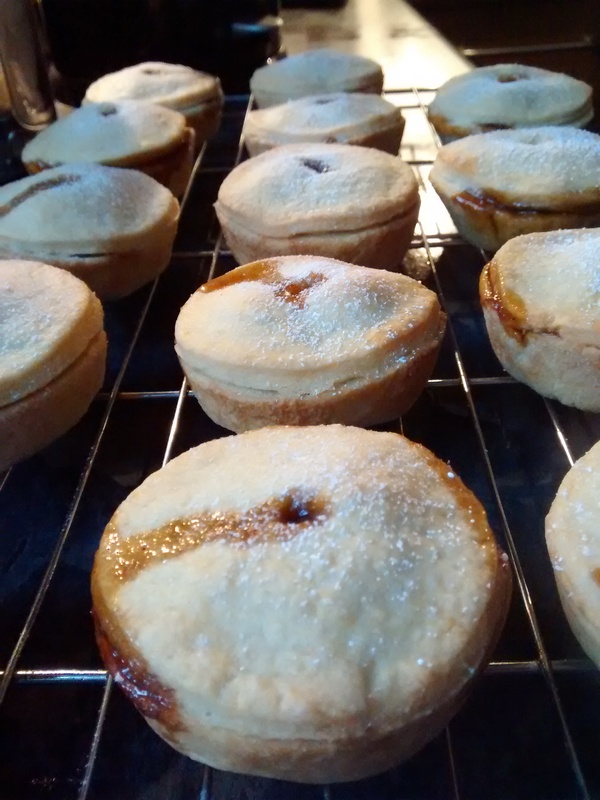 One thing I would say is don’t forget to sift the icing sugar first – I always do this when making icing and it really makes such a difference to the consistency. The coconut flavour comes from dessicated coconut, but I think next time I would reduce the amount of triple sec and add a splash of Malibu to even things out slightly, and perhaps use some coconut cream in the icing. That’s not to say you can’t taste the coconut – it’s definitely there, but as you all know by now, I can always go for more! This really is a lovely cake and I would heartily recommend it if you have a thing for citrusy bakes and/or fancy trying something a little bit different with coconut. You won’t regret it! My boyfriend is a bit of a hazelnut fiend, especially when said nuts are combined with chocolate, so I knew I had to make this recipe as soon as I spotted it in Dan Lepard’s Short & Sweet. It’s quite a summery bake, what with the meringue-style wafers and dollops of whipped cream, but it’s by no means unsuitable for the colder months! 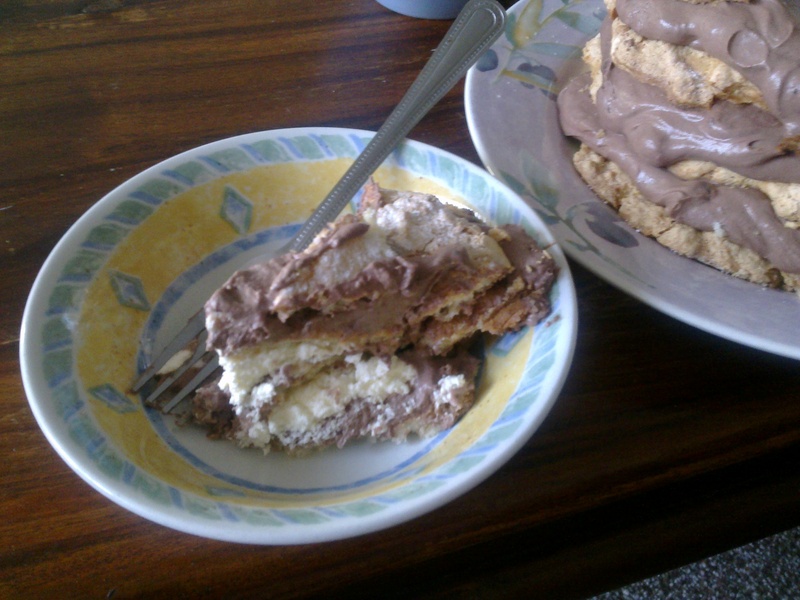 I had to make this in two stages – the wafers on one day, and the chocolate cream on the next. The wafers are made with a meringue-like mixture of whipped egg whites and sugar, with flour, butter and hazelnuts stirred into it. 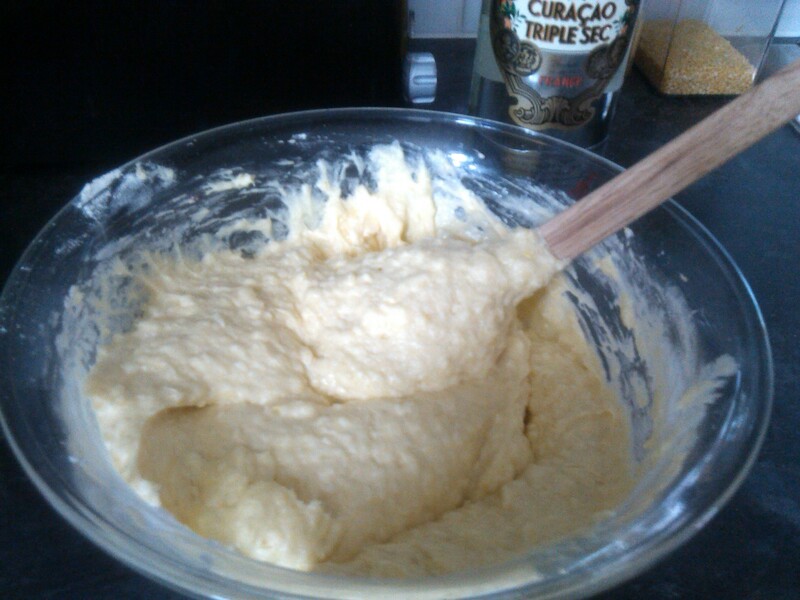 I have to say it took me a loooong time to get the egg whites and sugar to a suitable consistency; I’ve never had to spend so long whisking before (and this was with an electric whisk)! 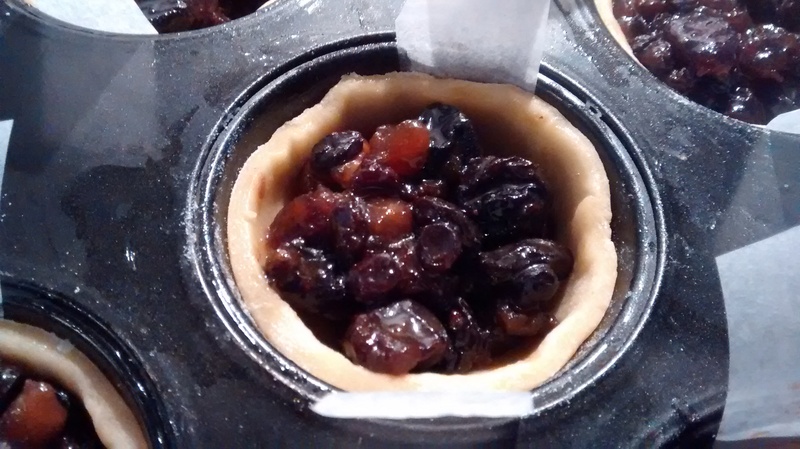 To my relief, the mixture eventually came together and it was then just a matter of adding the other ingredients, spreading them into circles on the baking trays and sticking them in the oven. The wafers ended up being quite meringue-y in appearance and texture, yet very wafer-like in taste. I assume this was the flour and butter coming into play, but it was a still a little odd! There’s no picture in the recipe book, so I just had to hope that’s what they were supposed to look like. 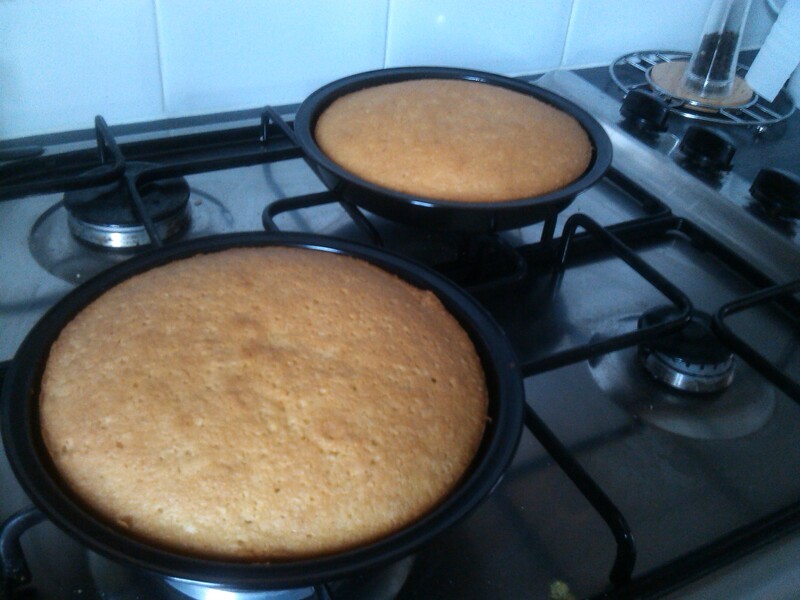 Unfortunately, the wafers stuck extremely fast to the trays (even though I’d slathered them in butter), so there was a fair bit of breakage around the edges, which is why the finished cake looks pretty untidy! So, the next day it was on to the cream. This was surprisingly faffy – I had to heat some sugar, cocoa and egg yolks together, leave it to cool for exactly 2 minutes, stir in some chopped chocolate and then stir a whole mess of whipped double cream into and it and chill it in the fridge. I ended up with chunks of chocolate in the cream where it didn’t manage to completely melt as I stirred it in, but this was no bad thing in my opinion! I then had to make a smaller batch of vanilla cream and proceed with the tricky business of layering the wafers and cream together. I say tricky, because I am notoriously bad at making layer cakes look neat. 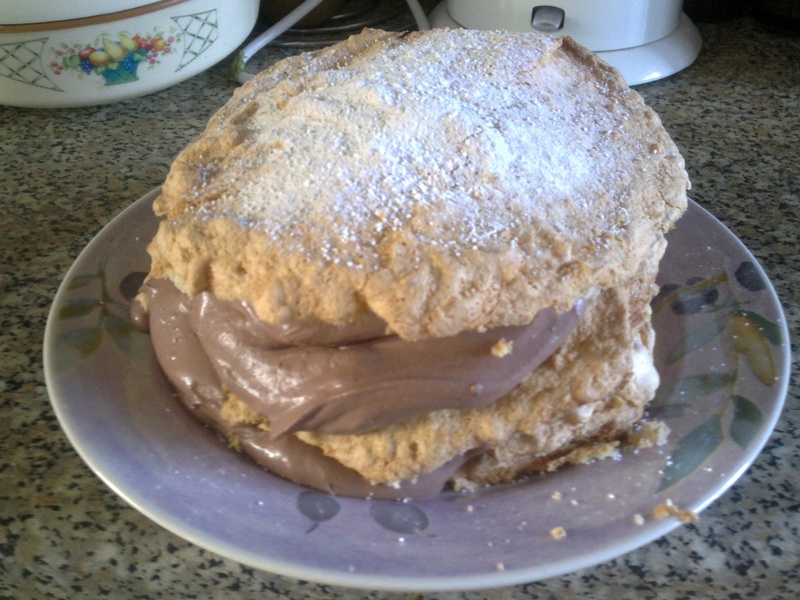 The irregular shape of the wafers and the huge amount of cream didn’t help my cause with this bake, but I did my best! I spread the chocolate cream on three of the four wafers, then dolloped the vanilla cream on the same wafers, before piling them on top of each other, finishing with the ‘clean’ wafer. A quick sprinkling of icing sugar and voila! 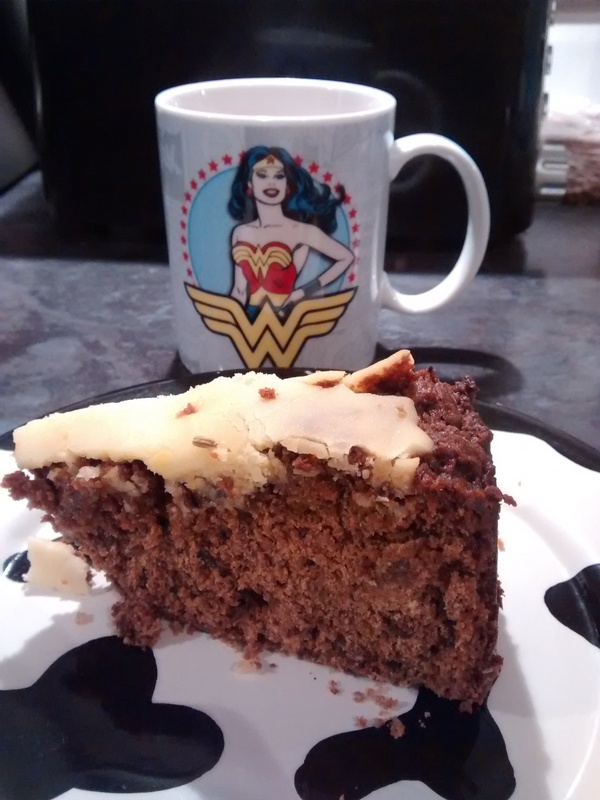 One very messy, calorific and delicious cake. The cake was truly scrumptious – the wafers were chewy in the middle yet with a decided crunch to the outside, and the two types of cream combined wonderfully with the nutty and cocoa-y flavours. 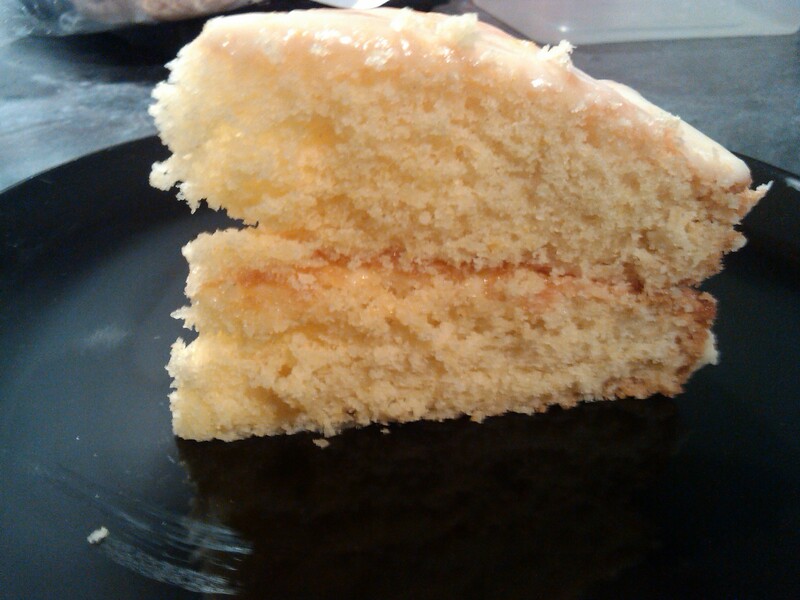 The wafers did soften after a day, but the cake was still lovely to eat! It disappeared in record time (and that’s saying something for my household), which is testament to just how moreish the cake was. From Short & Sweet by Dan Lepard and also in his column for the Guardian. It’s been a bit of a funny weekend baking-wise. I made some salt caramel millionaire’s shortbread yesterday that didn’t turn out quite right, so I thought I’d blog about it the next time I make it (when it will hopefully be better!). I was desperate to bake something else this weekend, though, so I settled on this rather lovely chocolate cake recipe from Dan Lepard. 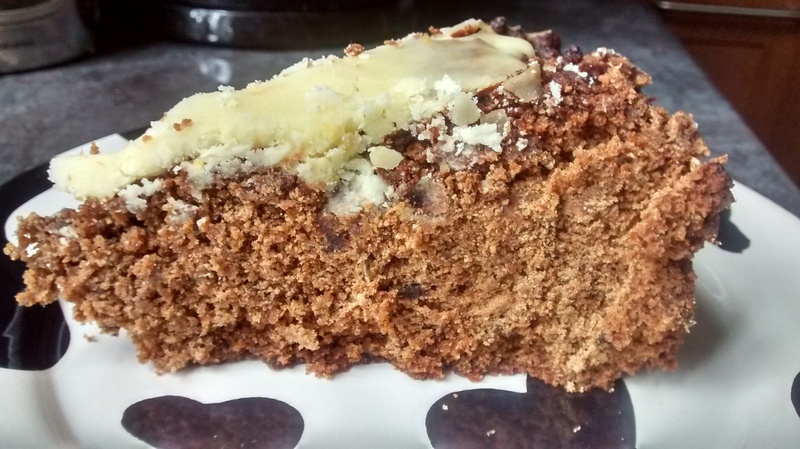 I think it’s called alchemist’s cake because it uses seemingly innocuous ingredients to create something rather decadent – it’s actually a low fat cake, but manages to be wonderfully moist and tasty despite the fact there’s no butter in it! The fat comes in the form of walnut oil, while the moistness comes from a bit of an odd ingredient – tinned pears. You can’t taste the pears at all, though – it’s just a damn good chocolate cake. One of the things that probably elevates this over most other low fat chocolate cakes is the cocoa I used. 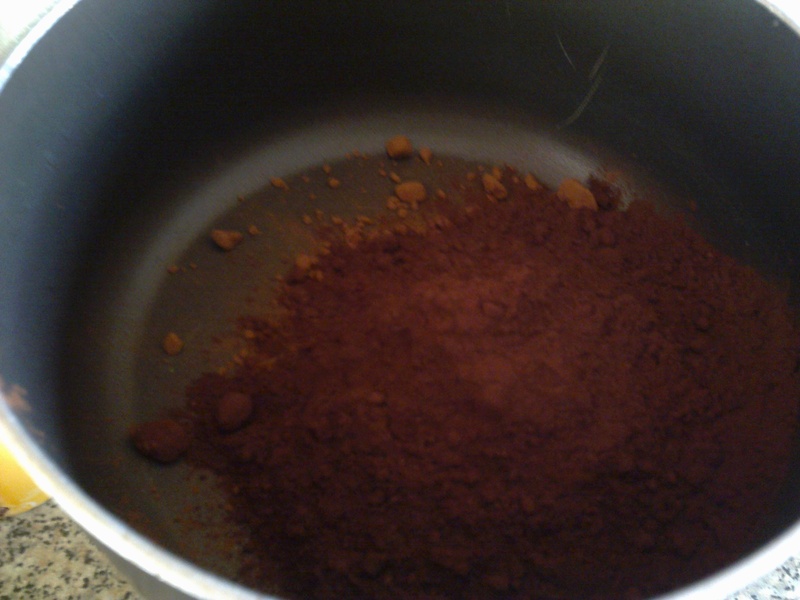 I unexpectedly ran out of my usual bog standard cocoa powder and only had 25g of it left, so I topped it up with… *drum roll* … some Valrhona cocoa powder. This is a top-end cocoa powder from a very highly regarded chocolate brand – Google it if you’ve never heard of it. 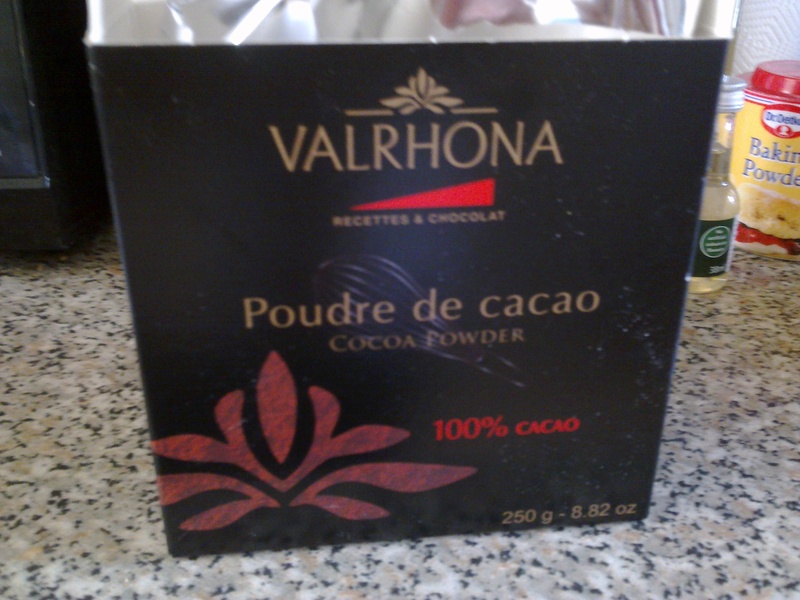 I’ve never had Valrhona’s chocolate bars (apparently some aren’t as good as you might expect, but others are very good), but I bought this cocoa powder quite a while ago with the vague intention of using it in something special. You can tell it’s of the highest quality – in the below photo, you can see the gorgeously dark, fine Valrhona on top of the paler standard cocoa powder I mixed it with. Anyway, the recipe was pretty easy, even though it involved a saucepan AND a blender! 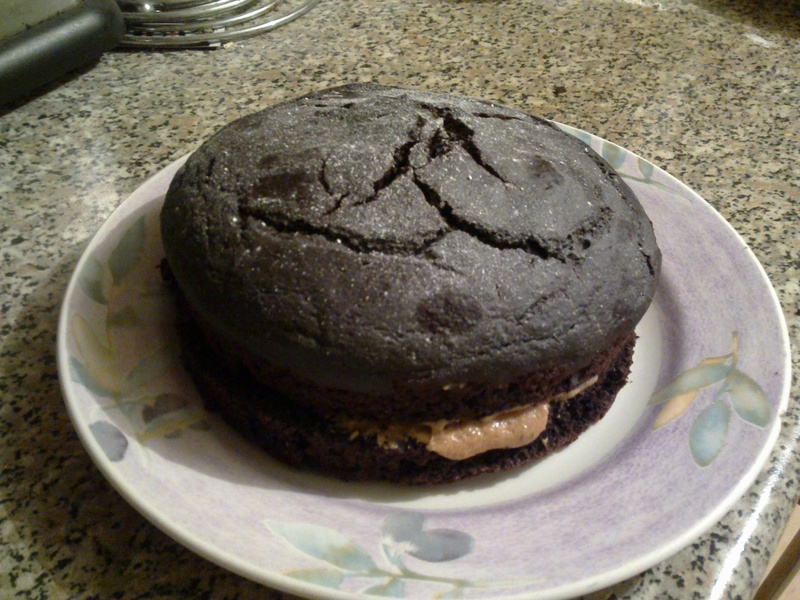 The result was a fantastic looking cake – you’ve got to admit it doesn’t look like a healthy option! 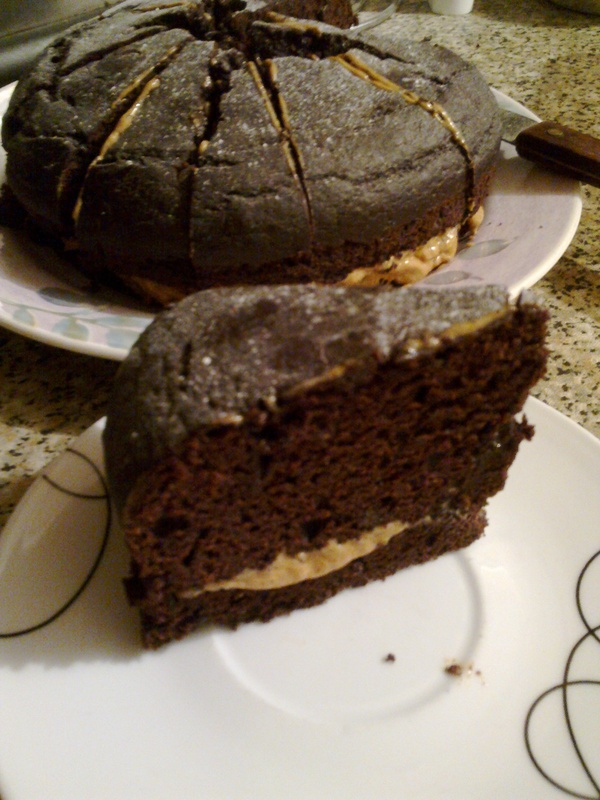 I decided to make things a bit more exciting by inventing a coffee and almond buttercream to layer it with (the original recipe just suggests serving as is, or with cream/melted chocolate). 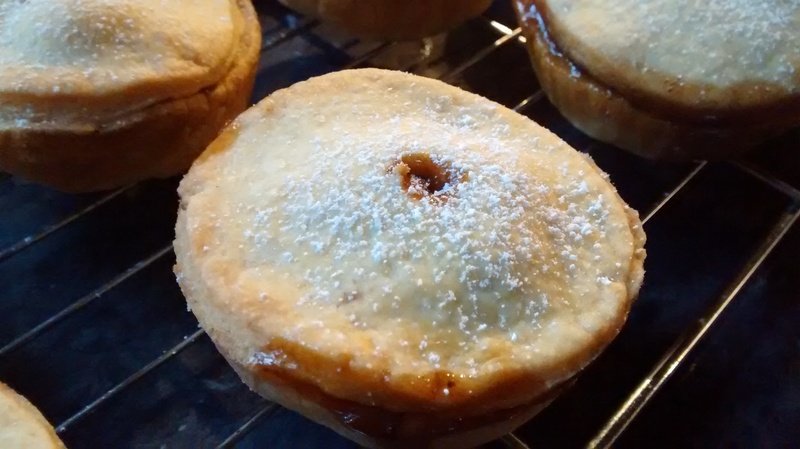 This was easy too – I gradually beat 70g of icing sugar into 50g of softened butter and 4.5 teaspoons of strong coffee (made with a couple of teaspoons of instant coffee dissolved in a splash of boiling water). Then I mixed in a drop of almond extract. Update: I have now sampled a piece of this cake. I honestly can’t believe how good it is for a low fat bake! It’s really very chocolaty and moist. I would recommend this recipe if, like me, you’re keeping an eye on your weight (6 WeightWatchers ProPoints per piece when cut into 10 pieces without buttercream, 8 ProPoints with the buttercream). From Short & Sweet by Dan Lepard, and also in his column for the Guardian (this version is slightly different though – the book recipe I used called for 3 medium eggs instead of 1 large egg! ).